And whether I should knit a pair of awesome socks that zing. I decided it was about time that I addressed the epic task of knitting Mr Awesome a new pair of socks. Two things now stand in the way – they have to be boring man colours (he says they don’t – though last year he said that they should be black or grey, so maybe he has just come to accept that loving a knitter means that you can’t fight the use of colour with any success) and he has ginormous UK size 12 feet. Big old feet and many, many stitches. A pair of stockinette socks would be the quickest way to go, but my goodness, what a boring task. I have thrown in a little added interest by the use of a simple stitch pattern. I’m also making these socks with a flap and gusset style heel, to see which he prefers between the fit of that heel in comparison to the short row heel that I used last year. This yarn is the one ball of yarn that I picked up whilst shopping in York. I visited Ramshambles where I hoped to pick up a skein or two of souvenir yarn as a treat from my trip to that lovely city. Unfortunately, the store did not seem to carry any yarn other than the standard big brand ranges, so I settled with at least leaving with something that I knew I could put to immediate use. This ball of Wendy Mode is a standard 75% wool, 25% nylon blend, but the single ball of this yarn that sat on the shelves was a colourway that I thought would be perfect. Named Hawkshead, it is predominantly a hazelnut brown with a few teal fibres blended into the plies. It gives the appearance of almost a two-tone effect. The combination of the easy knit and not-too-slow growth of the first sock is at least keeping my interest so far, though I will re-evaluate my feelings by the time I reach the heel of the second sock. I hope you have enough yarn in that one ball. I am currently knitting the husband a pair of socks and it was touch and go on the first one – I am using two 50g balls of Regia and just doing stockinette. He is only an 8 and a half!! 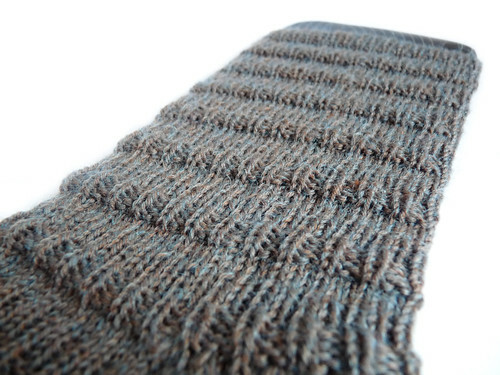 The sock pattern is lovely and it’s knitting up beautifully. 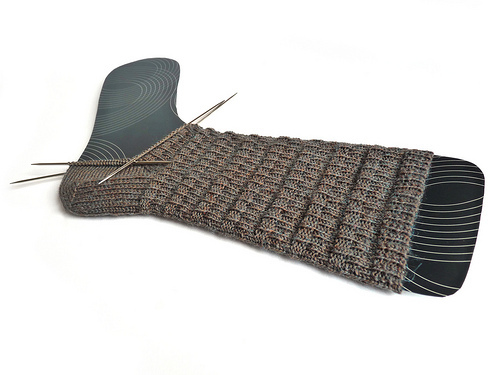 Now I’m off to revisit your sock blocker tutorial because I must make some!